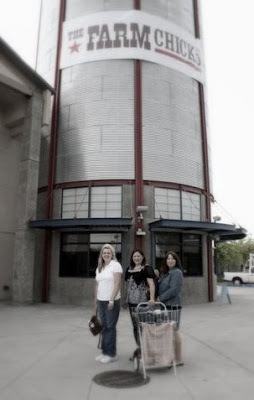 Terri, Jacque, and Paula go to a. . . There's nothing more fun for vintage collectors and crafters than an event that draws a large group of them together to 'show and tell', shop, gather ideas, and share. It's like one big party! That's what happened last week-end in Spokane, Washington at The Farm Chicks Show. This post is for those of us who weren't able to attend, but wished we could have! Paula and Terri, from Elm Street Antiques, are back to their shop and report a very fun and productive time (if you count a trailer, an SUV, a car truck, and more all filled to the brim with new goodies!). Paula is shown in the photo above (center) with her sisters (Jacque is on the left and Terri is on the right). Together they enjoyed a very good time as they worked together to find new treasures for their shop on Elm Street. Other Farm Chick adventures have been happening around the country as well, as Teri and Serena have been on a book tour signing for their new cookbook, Farm Chicks in the Kitchen. You might remember this previous post on Gracious Hospitality that shared of my opportunity to chat with them one day when Karleen and I went grocery shopping together and timed it for the book signing hours. 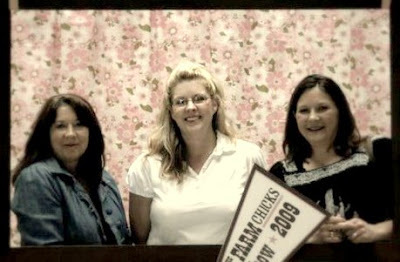 And you can visit a few other blogs of happy attendees at The Farm Chicks Show below. I think you'll see some common threads to this post --- such as group photos in front of The Farm Chicks silo and lots and lots of farm-chic ware! Happy browsing! Wishing you a very happy 'farm-chic' & Farm Chick day! I think I must go to the next Farm Chick sale. Several bloggers from the Portland are had booths there with lots of pink and white in them. It sounded like such a fun show. How fun, Gal!! 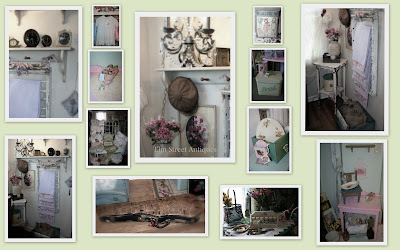 I'm not a vintage shabby girl, but love looking at it all!! Thanks for your sweet comment about your bracelet! Made my day!! Have a wonderful weekend, my far away friend!! Sure would love to visit out your way some time!! Looks like a fabulous event! Hope you have a wonderful week.